Exciting Tales of the Albany Planning Board is a program recorded before a live studio audience once a month in which the fates of multi-million dollar projects around the city are (partially) decided. 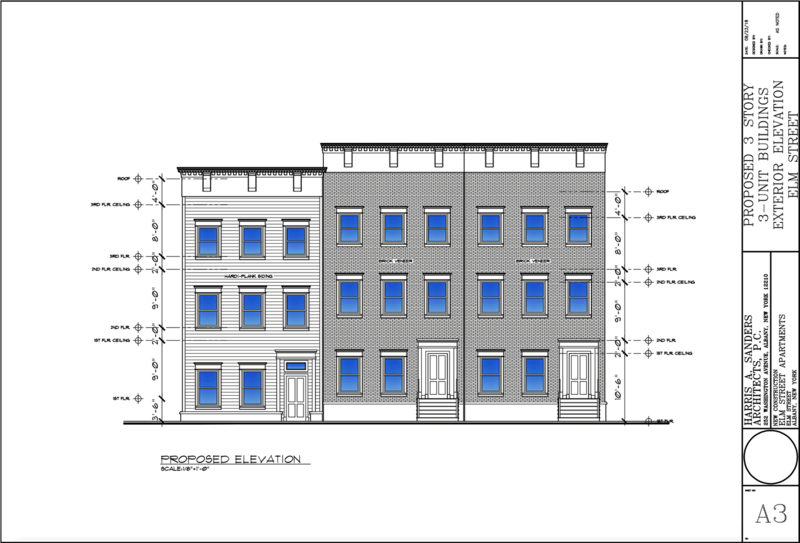 The spotlight item on the agenda was a proposal from 100 N 5, LLC and Paul Bonacquisti to build three 3-story townhouse-style buildings with three 1BR apartments on a string of four empty lots on Elm Street in the Hudson/Park neighborhood. The project would condense the lots to three parcels, one for each building. This proposal has been been a hot topic on the active listserv for the Hudson/Park Neighborhood Association after word started circulating that a non-profit called CARES, which assists programs for homeless people, was attached to the project. That led to a big discussion about density, owner-occupied housing, property values, crime, and accusations of NIMBYism. And last week there was a public meeting scheduled with CARES officials in order for the neighborhood to ask questions. The project prompted big turnout at Thursday's planning board meeting and at one point there were 20 people signed up to speak during the comment period. Engineer Luigi Palleschi of ABD Engineers represented the project before the board and gave an overview. He explained that each building would include three apartment units. One of the buildings would be a bit shorter so that its entrance would be flush with the sidewalk in order to be accessible to people with disabilities. Storm water would be stored on the roof. And he said he believed the rowhouse style of the buildings fit with the character of the neighborhood. There was no discussion from the board. + Three speakers said they were in favor of the project, with their arguments mostly focused on the new units meeting a need for new housing. + Multiple opponents of the project focused their dissatisfaction on the city government, alleging that the new zoning that allows the construction of three-story buildings in residential townhouse zones hadn't been highlighted during the big Rezone Albany process and that, in some sense, had been slipped through. Board chair Al De Salvo took issue with the notion that there hadn't been enough opportunity for people to learn about the Rezone process (there were many public meetings), which provoked some heated back and forth with members of the crowd. + Multiple people said they believed that buildings with three 1-bedroom apartments are out of character with the neighborhood because many of the nearby homes are 1 or 2-family. + Others warned that allowing this project to go through would prompt families to move out of the neighborhood. Some said they were scared for what could happen. + A few commenters took issue with the proposed construction of the buildings and said they were worried modern building codes don't offer enough protection from fire in this context. + And others pointed to a previous proposal, from 2015, that had gone before the city's Board of Zoning Appeals that had resulted in approval for two-family homes on the site. They said they were in favor of that plan and pointed to the recent sale of similar new-construction homes on Jefferson Street. + Common Council member Richard Conti -- who represents the other side of Elm Street -- also spoke in opposition to the project. He said the project is not consistent with the character of the neighborhood, and approval would open the way for de facto small apartment buildings in the neighborhood. Conti also added that he believed the zoning that now allows the construction of three story buildings in the R-T zone is not consistent with the intent the Common Council had for these neighborhoods and he will will be looking at this issue as the council considers amendments to the Rezone overhaul. + Albany County legislator Chris Higgins spoke against the project, drawing a contrast between the current plan and the proposal that gained approval in 2015 for two-family buildings. And he said he was worried this project could be a prompt for families to leave the neighborhood. + John DeBois -- president of the Hudson/Park Neighborhood Association -- said the org is opposed to the project. He submitted a multi-page letter from the org detailing its objections. And Clare Yates -- chair of the zoning and codes committee for the Center Square Association -- commended the HPNA letter and said her org stands with its neighbor org. The board was not scheduled to vote on the project Thursday. The appearance was for an introduction and to allow the board to declared itself the lead agency for the purposes of the State Environmental Quality Review Act (which it did so later in the meeting). And as Al De Salvo noted, the project still must go before the city's Historic Resources Commission and make a return to the planning board. Redburn Development was back before the board for another piece of "The Kenmore portfolio," which is probably the most significant real estate development project in progress in the city. 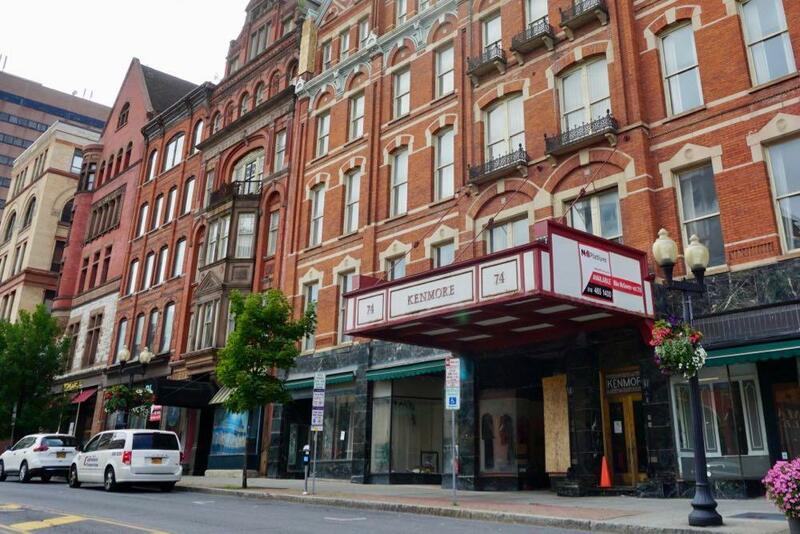 Redburn is the process of acquiring a group of prominent downtown Albany buildings that have been vacant or underused for many years and is planning to redevelop them for mixed-use residential. 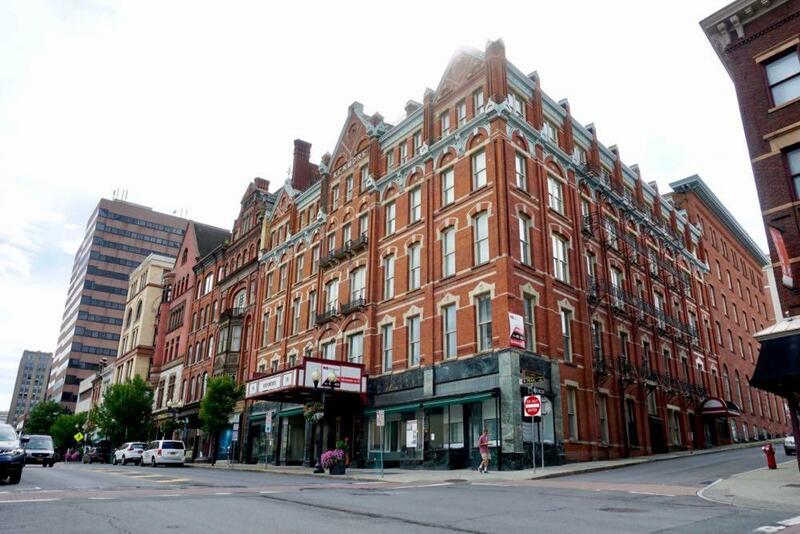 Last month the company got approval for a residential conversion of the old Times Union building at 16 Sheridan. 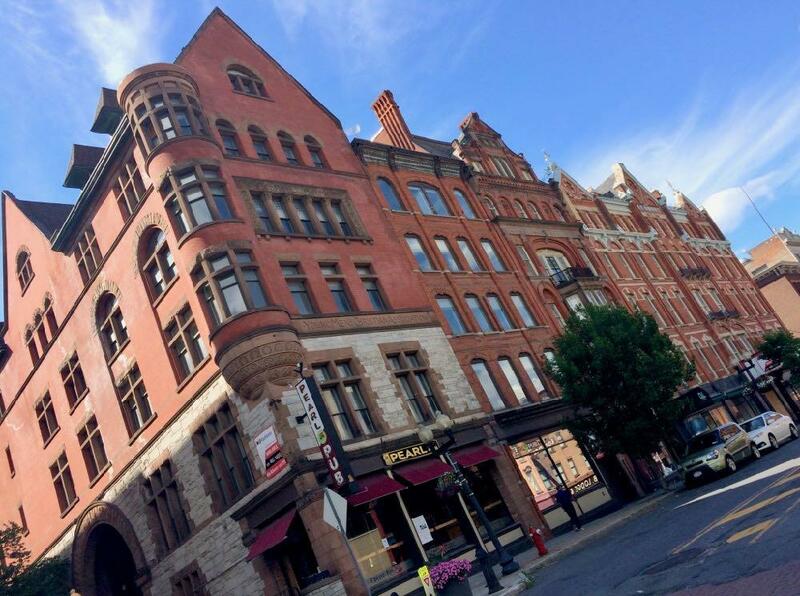 Up this month: The old Steuben Club building (1 Steuben Place) and old Kenmore Hotel (76 North Pearl), two parcels that make up an entire block. Jeff Buell -- one of Redburn's principals -- was again there to rep the projects, which the board took together. He again emphasized a desire to get retail back into the street level of both buildings to reactivate what has been a dormant block. Redburn is proposing to redevelop the old Steuben Club building to include 59 residential units, a mix of mostly 1BR and a few 2BR. Jeff Buell said the plan is to find a restaurant tenant for the old Pearl Street Pub space on the street level. And ideally, he said, they'd want to use the old Steuben Club gym space for some sort of gym, though that could be a bit of challenge because it's not currently laid out in anything like a modern gym. But: "The pool is still there. I don't know how, but it's in pretty good shape. It still has water in there." Buell also told the board that 1 Steuben is in good condition: "The building is in pretty incredible shape from a structural perspective. It was built very well and isn't going anywhere." Redburn is proposing a redevelopment of the old Kenmore Hotel building to include 63 residential units, most of them 1BR. (Though there's a plan for one unit to include two floors and 3 bedrooms.) Buell said the building will require some extensive reconfiguration because it has, by his count, 264 rooms. One of the spaces that's of particular interest is the old Rainbo Room, a night club that hosted a bunch of touring jazz greats and was the spot where Legs Diamond celebrated his acquittal on the infamous night he was later killed on Dove Street. Jeff Buell said Redburn has promised the State Historic Preservation Office that it would be restoring the Rainbo Room. And to that end, he said Redburn has a handshake agreement with an operator to use the space for events and weddings. There's also a plan to add a rooftop terrace, set back so it won't be visible from the street. Buell said the terrace could be an amenity for the event space. Both the Steuben building and the Kenmore building are landmark downtown buildings -- the Kenmore, especially, has all sorts of history associated with it. Jeff Buell told the board the plan is to get the street level commercial spaces filled first because renovations for the upper floors will probably take at least 18 months. He said Redburn has already hired a historic consultant to assist. There were two public comments, both in support. One of the commenters was Ian Benjamin, who also said he's like to see the project include some kind of athletic or gym facility. There wasn't much discussion from the board, and no votes. The projects are set to return at a later date. This project has been up before the board multiple times. 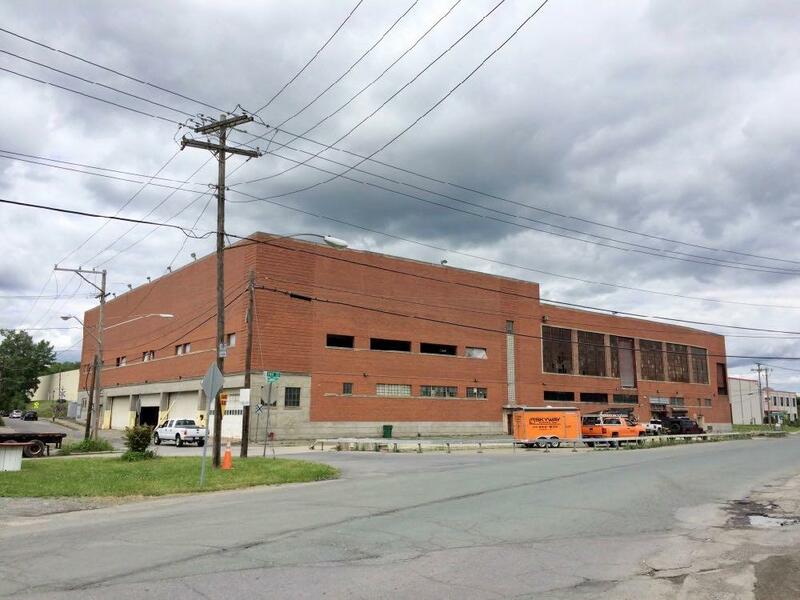 U-Haul of Eastern New York is proposing to turn the massive* old brewery building on the southern edge of the Warehouse District into a facility for self-storage and its U-Box container storage. And reps for the company and the firm Environmental Design Partnership were back to give a brief overview. One of the sticking points for the project has been the a short segment of what's technically Montgomery Street that's in front of the building along Erie Boulevard -- specifically what to do with it, and how. And now there's a plan: Brendan Ferguson of Environmental Design Partnership told the board that U-Haul has been negotiating with the city of Albany to use the street segment as a driveway and parking lot. The project also would no longer be turn a small site across N. Lawrence Street into a parking lot. There was very little discussion with the board and no public comments. * The building -- not the site, the building itself -- covers 1.3 acres. The board voted 5-0 to grant a conditional use permit for the project that's contingent on the company working a deal with the city over using the Montgomery Street segment. Photos of 48 Swinton Street from the engineer's report filed by the land bank. 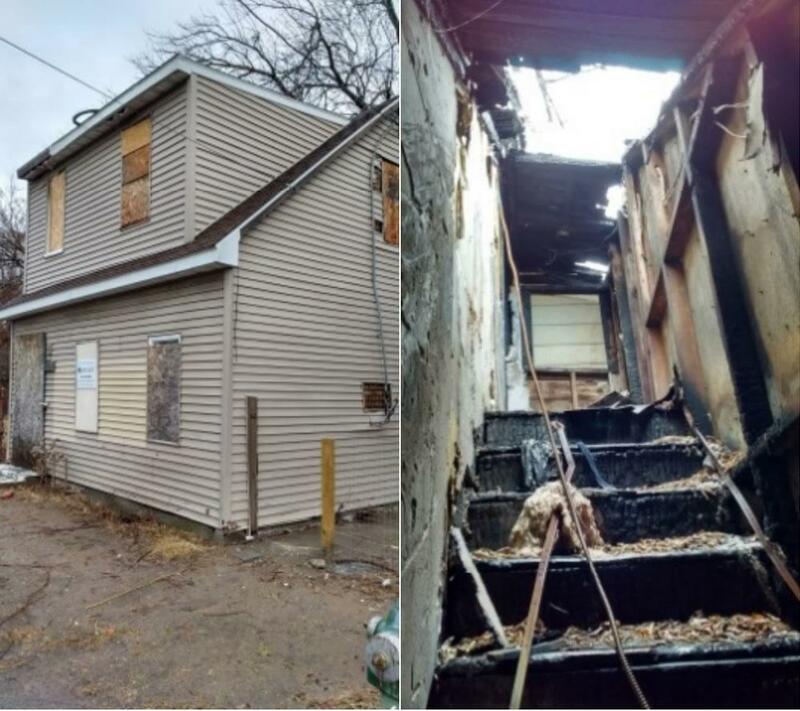 The Albany County Land Bank was before the board again seeking demolition approval for properties, this time for two in the West Hill neighborhood. The land bank's Charlotte O'Connor told the board that 48 Swinton Street (project file) had suffered significant fire damage, had a hole in its roof, and the framing and walls had become compromised. She said there had been some interest in the property, but it was contingent on the existing structure being demolished. And if the land bank got approval, O'Connor said the parcel would be packaged with the adjacent 46 Swinton, which the land bank also owns. Board member Glinessa Gaillard asked why they'd be packaged together -- O'Connor explained the same potential buyer had expressed interest in them combined. About 320 Second Street (project file): Charlotte O'Connor told the board the building had major roof leaks, standing water in the basement, and foundation problems. Portions of the floor and framing had also collapsed. She said if granted approval to demolish, the land bank would most likely look to move the property through its side lot or discount lot programs. Durham School Services -- the school bus company -- is seeking a conditional use permit to open a dispatch center at a site on North Pearl Street and Loudonville Road. The land has been occupied by a construction company, which has used the site to store construction equipment and material. Engineer Daniel Hershberg of Hershberg & Hershberg was there to rep the project, and did his thing outlining the plan. Hershberg said the site wouldn't change much -- existing green space would be retained, the parking and driveways would get new crushed stone, and the warehouse building would stay. Durham plans to store buses on site and use the warehouse space there for dispatch operations and some bus storage and repair. Hershberg said Durham projects the dispatch center could ultimately generate 320 trips per day, many of them headed into the city of Albany. He said the facility wouldn't start out at that level and the estimate is based on possible growth. 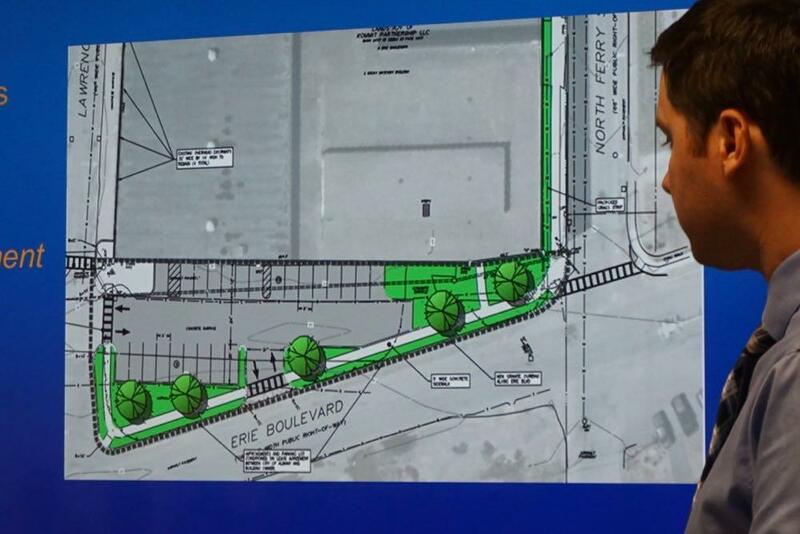 The project has already filed a traffic generation analysis and Hershberg said the engineering firm Creighton Manning is working on a traffic analysis for nearby intersections. There was minimal discussion from the board, and there was no vote. The project will be back before the board at a later date. Wow. 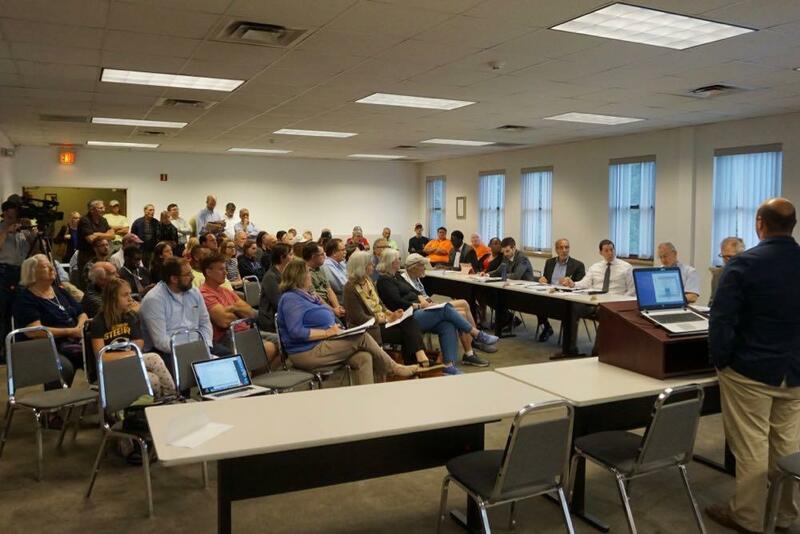 I'm really disappointed in everyone that came to speak out against the Elm Street project. I'm especially disappointed in our elected officials who spoke out against this obviously good project. It's amazing to me how the same people who support affordable housing will turn face when it is proposed for their own neighborhood. "Homeless housing for thee, but not for me". Do you want more affordable housing in the city? Allow all housing to be built - everywhere and anywhere. Do you want to fight climate change? Allow increased density, especially in neighborhoods with high walkability and good transit service. Denser living is environmentally friendly, and denying projects that increase density is akin to denying the existence of climate change. Do you want to help the homeless? Allow housing to be built for them - everywhere and anywhere. Do you want to keep and create a vibrant, interesting city? Allow different building styles and uses - everywhere and anywhere. Three story buildings are completely in character with two story buildings - after all they are only one story higher and the obvious next step. Housing should never be uniform. We all have different needs and are at different places in our lives. Our housing ought to reflect that. Build more housing.